If you read an older version of my “About Me” page (now edited), you’ll know that the trench coat I made many, many years ago was my most treasured, favourite thing I ever made. Well, I was browsing through some old photos belonging to my parents-in-law, when I came across this one. It was taken in the early winter months of 1982. I was pregnant with Gita, my second child, who was born in August that year. 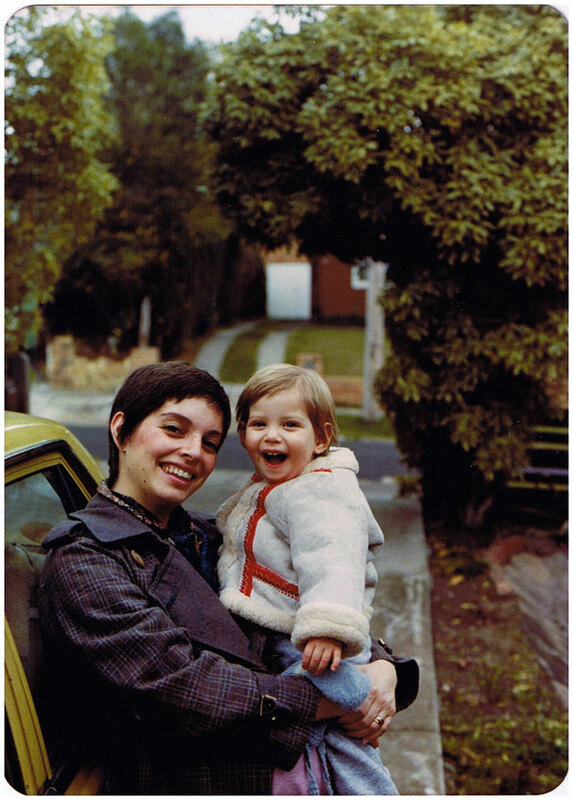 We’re standing in the driveway of Moshe’s parents’ house in Hilda Street, Balwyn, and I’m leaning against our old mustard-coloured Toyota Corona. I remember I’d hated that haircut. It was too short and pixie-looking. Devorah was 1½ years old. She’s wearing a little jacket made by Moshe’s Auntie Sala in her factory in Carlton. It was her birthday a couple of days ago. I’d forgotten that I had photos of myself wearing this coat. I can’t tell you how happy I am to have found one. The funny thing is, it’s a photo that we took and gave a copy of to my in-laws, so I must have it somewhere too! Unfortunately for many makers, pain or discomfort come part and parcel with crafty pursuits. You’re not alone! Click here to read how I learned to make without debilitating aches and pain, and also find out about the new workshop I’m running over at Ease the Tension.